Udi’s classical music training began at the age of seven in Tel-Aviv, studying with Uzi Wiesel, supported by the American Israel Cultural Foundation. Later he came to the U.S. to study with Leonard Rose at the Juilliard School, and conducting at the Curtis Institute of Music with Max Rudolph. 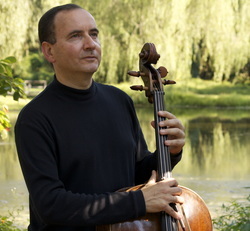 Winner of the 1976 International Villa Lobos Competition in Brazil and the 1984 WFLN Young Instrumentalist Competition, Udi has appeared as a soloist with the Philly Pops under Peter Nero, and given recitals in Spain and California, appeared on the TODAY show and radio broadcasts with Network For New Music. He has also been represented by Astral Artistic Services and the Center for Jewish Culture and Creativity. An acclaimed soloist, Udi performed with leading orchestras in Israel and recorded at the Jerusalem Music Center founded by Pablo Casals; served as the principal cellist in the International Youth Orchestra, the National Orchestra of New York, and with the American Ballet Theatre. He was a member of the Concerto Soloists of Philadlephia, and joined the Philadelphia Orchestra in 1987, of which he served on the Board of Directors and as the Artistic Coordinator for the Hear O Israel concert at the Core States Center. As a chamber musician, Udi has collaborated with Christoph Eschenbach, Leon Fleisher, Jaime Laredo, Rudolph Buchbinder and others, and taught at the Eastern Music Festival. Inspired by visits to Arab, Jewish and Buddhist villages, in 2003, Udi became the founder, president, and artistic director of Intercultural Journeys, a non-profit organization based in Philadelphia which is committed to presenting performances, conferences, master classes, lectures, and other interactions that provide opportunities for musical dialogue and understanding among a variety of cultural traditions. In partnerships with the Philadelphia Orchestra in 2007-08, Intercultural Journeys presented multi-media concerts, including Arab/Jewish cross-cultural presentations, and paid homage to native American music, and its influences on Dvorak’s New World Symphony. Spreading the messages of hope, understanding and co-existence, Udi continues to work tirelessly to perform and create opportunities for open dialogues, bringing people together from difference cultural backgrounds at universities, public venues, and peace loving communities. His unique genre of cross-cultural music has been heard all over the world. In the last few years, Udi has traveled as far as China, Spain, Italy, Palestine, Israel, and across the U.S. with the international group of artists, including Mandy Patinkin, Jie Bing Chen, Nawang Khechog, Hanna Khoury, Wu Man, Diane Monroe, R. Carlos Nakai, Kareem Roustom, and Simon Shaheen. Together, they have made numerous appearances on international radio and TV, and collaborated regularly with WHYY and WRTI in Philadelphia. Check out Udi’s the most recent CD Beyond Borders! This amazing recording features a cello choir recorded on multiple tracks by Udi, exploring new sounds of cello – improvisations based on the music from the Middle East and American Spirituals.